The Department wants safe driving conditions, when it plows the snow on the Essex town roads. Plowing snow from private driveways into an Essex road is prohibited. The Department only removes snow from Essex town roads, and residents are responsible for plowing their own driveways. 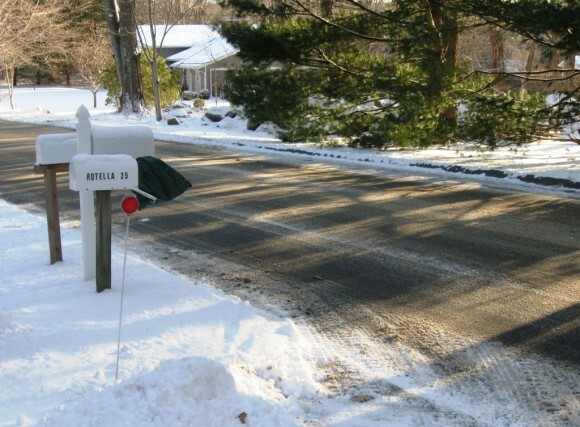 Essex residential mail boxes should have sufficient support posts, so that the Essex town snow plows won’t knock them down. If the Essex town snow plow destroys a mail box or post, the town of Essex will pay up to $75 to replace it. Essex residents should not put trash cans and recycling bins in a town road when it snows. Any plantings, fences, walls, invisible dog fences, sprinkler heads, and the like, which are damaged by Essex town plows are not the Town of Essex’s responsibility to replace. For further details, call the Essex Public Works Department at 860-767-0715.